Chania is the capital of the prefecture of Chania and the second largest city in the island of Crete, after Herakleion. It lies in the northwestern part of the island and it has a population of 53,910 inhabitants as of 2011. The region that today hosts the city of Chania has been inhabited since the Neolithic period and it has been a very important region since the Bronze Age, when it hosted the ancient Greek city-state of Kydonia. Kydonia was founded by King Kydon (or Cydon), son of Hermes and Akakallis, the daughter of King Minos. 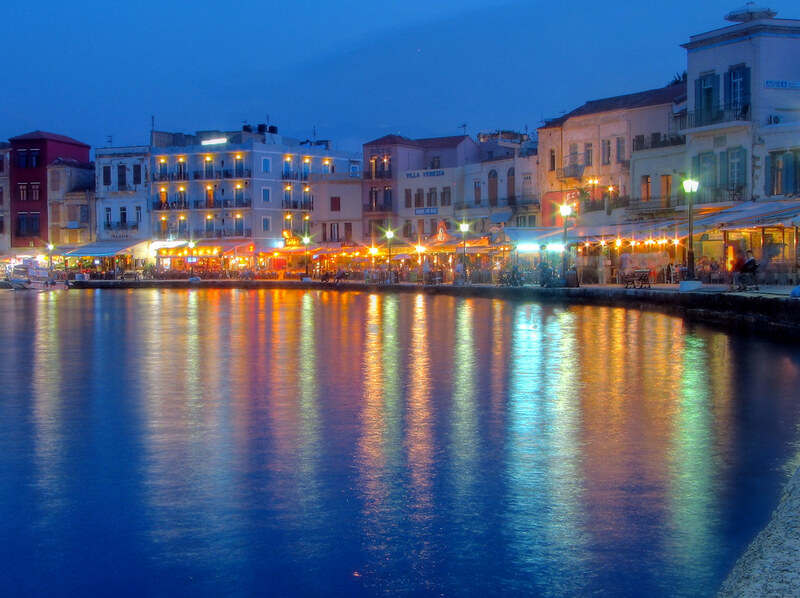 Today, the city of Chania is consisted of two distinct parts. The picturesque old town, built around the old Venetian port, and the new part of the city extending to the south, east and west of the old town. Despite the fact that the new city is by far larger and hosts most commerce and residential quarters, one may say that the old town is still the core of Chania, and especially when it comes to entertainment. This is where most restaurants, cafes and night clubs are found and the place-to-be, especially in the summer. One should definitely not miss the Municipal market, which is located in the south border of the old town and where one can find fresh fruits and vegetables, fresh meat and fish, cheese, herbs and spices as well as groceries. The Kasteli Hill (Lofos Kasteli) in the west part of the old town next to the Turkish mosque. This is where the acropolis of the ancient Greek town of Kydonia was situated during the Minoan era of Chania. The blue markers shows the location of various accommodations in Chania. The letter in the marker describes the accommodation types: H for Hotel, A for Apartment, R for Resort, B for Bed & Breakfast and O for Other (e.g. pension, villa). Click on the blue marker for more information on the accommodation.